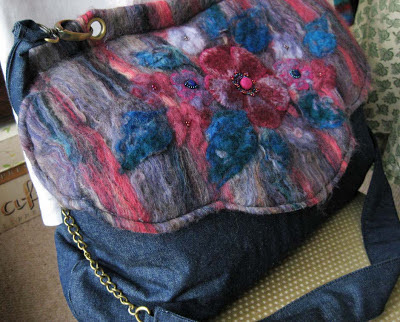 This is the first felt bag. No beads needed for this. Just a pattern from Lisa Lam's first book 'The Bag Making Bible'. I used 'The Reversible Bucket Bag' pattern with a few modifications. It is a slightly different size because you never quite know with wet felting how big it will end up and it is not reversible but has a lovely shocking pink lining instead. It hangs on a dining room chair with the current knitting or crochet project ready for me to grap to take out. Whilst I was finishing this bag I knew what I wanted to make next. A felt flap for Lisa's 'The Oversized Fashionista Bag' and I wanted to add beads to decorate the flower centre on the front. I just needed to decide how. So various ideas were tried. And here is the finished bag. I made the main flower centre by covering a button with felt and then sewed concentric circles of beads around and then added a picot edge of beads to finish off. The smaller flowers are a flat circular bead with one ring of beads. And yes there is a third bag on the way. This time a beaded dragonfly. I'm a super fan of covered/beaded buttons, Evanna...your samples are fabulous... this group would look really great framed. Thanks Sandy. So pleased your my first 'follower'. 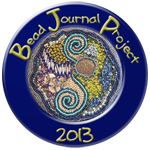 Hi Evanna, glad to see you joined the Bead Journal Project. It is so very inspiring every year, and Robin is such a great "Leader" and teacher. 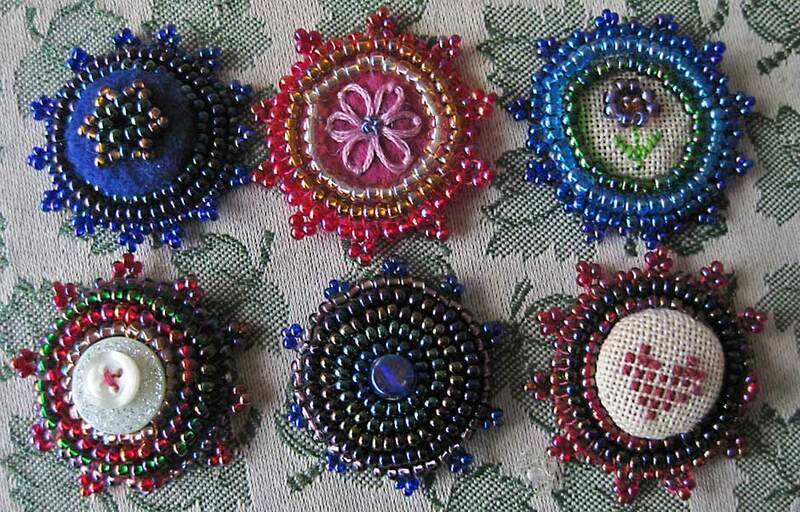 Love your beaded buttons/beads. I will drop in and see what your next project will be. 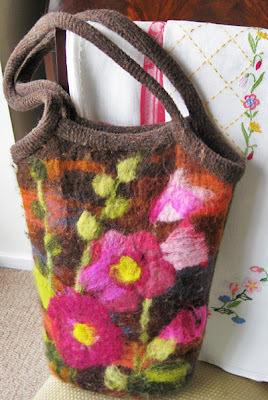 By the way, the felted bag is beautiful as well. Happy Beading! Thanks so much for your kind comments. As I'm new to this it's great to find comments and feel connected to the group. very nice items!!! I love bith felted and beading. I'm new on BJP as you, so, nice to meet you!